I'm very excited to announce two forthcoming exhibitions in Glasgow opening the end of this month and early next month. I'm also delighted that once again my work has been merited to serve as a milestone in the development and recognition of photography in the arts in Scotland. In 1997 I was the first photographer to be given a main gallery exhibition at The Glasgow Art Club. In 2015 my 'Selected Works' was the first time in The Scottish Gallery's 176 year history that an entire exhibition was awarded to a photographer and the only photographer whose work the The Scottish Gallery represents. 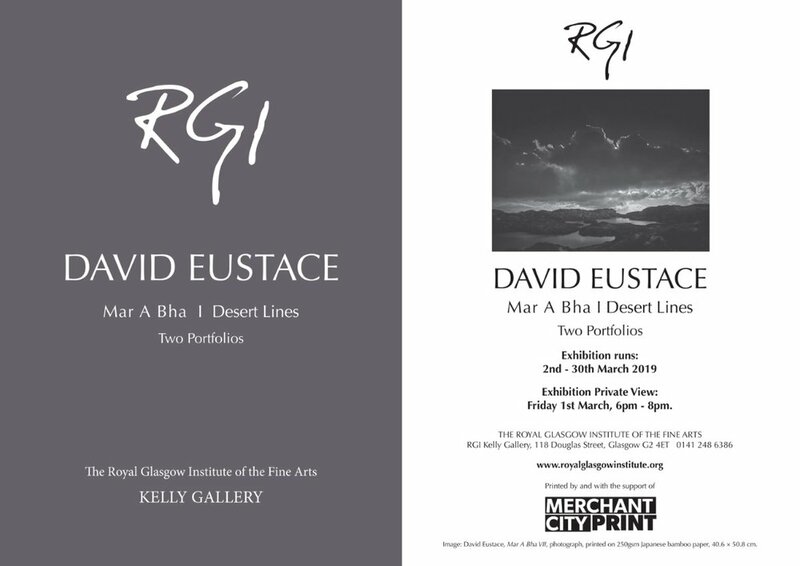 This coming March, 2019, my 'Mar a Bha' (English: 'As it Was") and 'Desert Lines' portfolios will be shown at The Royal Glasgow Institute of the Fine Arts / Kelly Gallery. This will again be a first. 'This is also the first time in it's 158 year long history that The Royal Glasgow Institute of the Fine Arts has devoted an entire exhibition to the work of a single photographer and we are excited to bring this opportunity to view ...' Jim Tweedie, RGI Gallery. 'This is emotionally intelligent photography, responding to, not controlling, a beautiful landscape.' Sara Stevenson, formerly Chief Curator of Photography at The National Galleries of Scotland. There is an opening evening on March 1st, 6pm - 8pm for those in Glasgow wishing to attend. The exhibition runs from 2nd - 30th March 2019. All prints are limited editions and available for sale. Please contact RGI. My second exhibition will be at SWG3. 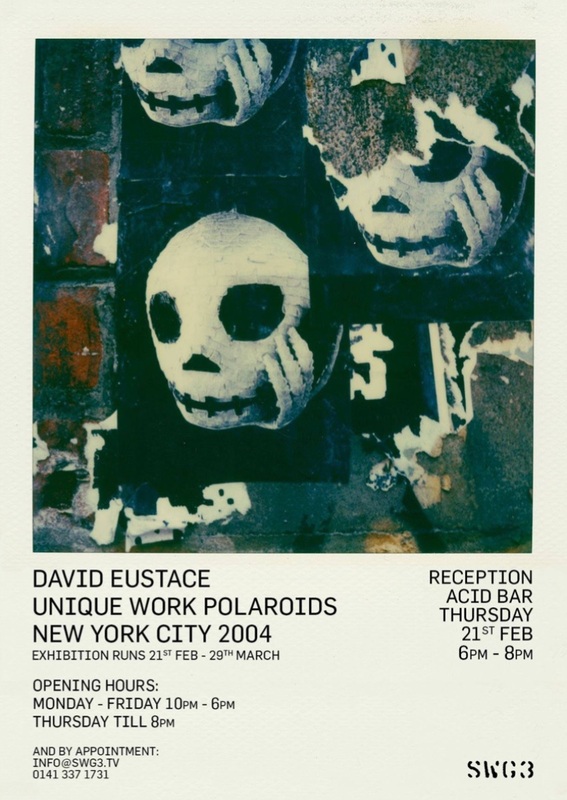 'Unique Works: NYC Polaroids 2004' portfolio will run from the 21st Feb - 29th Mar 2019. This unique body of work consists of 16 individual Polaroids serving as one work I made in SoHo, NYC back in 2004. Whilst on the surface this may seem a very different portfolio from those being offered at the RGI they are in essence from the same train of thought. The theme of time links these portfolios and not only supports but reflects how my work is developing. My relationship with SWG3 goes back to day one (fifteen years ago) when the gallery was largely a dream of Andrew Fleming Brown. I was part of the initial creative board to offer advice how the space could develop and form. Now regarded as one, if not the leading contemporary multi-functioning arts venue in Scotland, few could have imagined the growth and development of this dream. Andrew and his team have brought an energy to the arts with hopes well beyond any local boundaries. This has been rewarded by the talent this art space attracts. We're having a very informal opening night in the ACID Bar on the 21st Feb from 6pm - 8pm. Please contact SWG3 for details.